One of the most iconic cities in Europe, Berlin offers you a countless number of must see places. If you don't know where to start, have look at our top 3 must visit places of the city! Berlin offers the visitors not only a modern city exploration but also an excursion through the recent history. 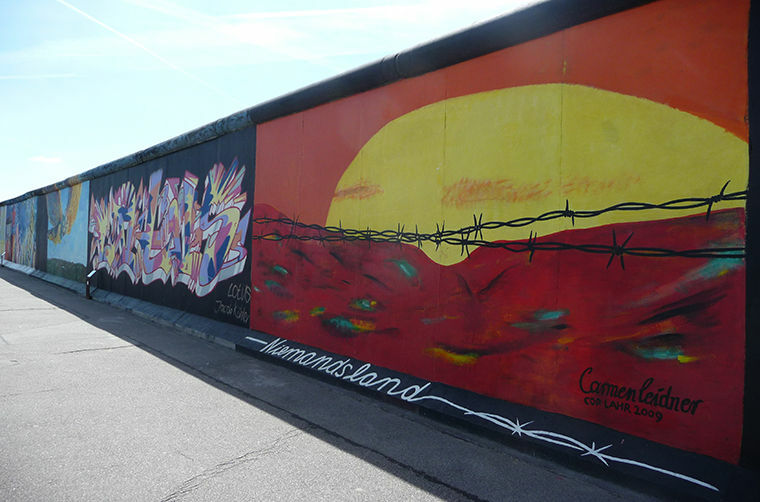 Of course, the place to start this enjoyable, informative and breath taking excursion is the longest remaining section of the Berlin Wall, namely the East Side Gallery. East Side Gallery constitutes the longest remaining part of the Berlin Wall with a length of 1.3 kilometers. It is located on Mühlenstraße in Friedrichshain-Kreuzberg area in Berlin. The wall today is home to 105 paintings painted by various artists. In addition, East Side Gallery is estimated to be the longest lasting and the biggest open air gallery in the entire world. Apart from the East Side Gallery, today the places where the wall used to stand can still be tracked by the iron marks on the streets of Berlin. Besides, a 80 meter long piece is now being shown in the Topography of Terror and another, relatively shorter piece is on Bernauer Straße. Walking down the road and admiring the art pieces while witnessing a major milestone in the recent history guarantees a unique feeling. A feeling that will surely be remembered among the beautiful Berlin memories when the time spent in the city is recalled. Brandenburg Gate is one of the most iconic landmarks in Berlin. As well with that, the gate also represents the unity of Europe in general. Brandenburg Gate was built to the order of Frederick William II of Prussia. He wanted the gate to stand as a symbol of piece. The gate was actually designed as a starting point of the road that leads to Brandenburg. When the conditions during the Second World War taken into consideration, the amount of the damage occurred makes sense. During the time between 2000 and 2002, the gate was fully restored. Today, it is still one of the most glorious triumphal arches in the world. Brandenburg Gate is located on the western Berlin, where Unter den Linden and Ebertstraße crosses. Some of the consulates of the other countries are located around the gate today and it is always possible to come across to some sort of celebration or a gathering there. With all of the lights surrounding this gigantic gate, Brandenburg Gate gets its best look during the night time according to some. Berlin Wall used to have crossing points and Checkpoint Charlie (the name given by the Western Allies) was one of them. The difference of Checkpoint Charlie was that it was used by only the allied soldiers, ambassadors, their families and German top level executives. After the demolition of the wall in 1989, the booth and the big sign was removed. However, as the place turned into a big attraction and visited by thousands of visitors every year, replicas have been placed instead of the original ones. However, the original ones can still be seen in the Allied Museum in Berlin. Checkpoint Charlie is located on the Friedrichstraße. It is also possible to see a large collection of stories, items and other things that belong to the period in the Mauer Museum, which is located very close to Checkpoint Charlie.